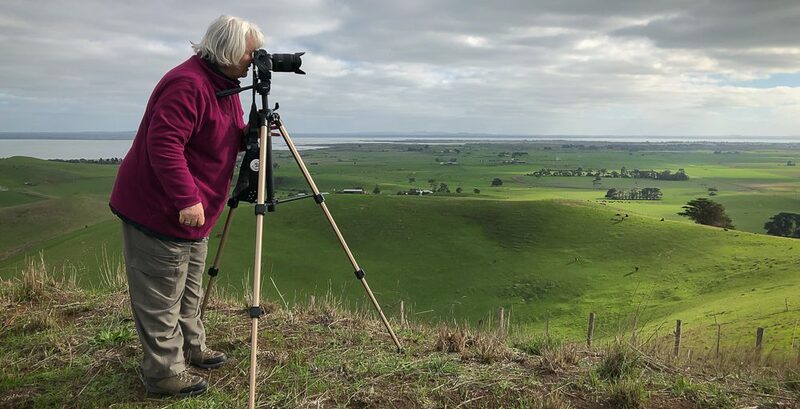 This seaside photography adventure, initiated by Craigieburn Camera Club, Melbourne, Victoria – Australia, brought together enthusiastic photographers, of varying skills, to take part in a three-day photography opportunity around The Great Ocean Road Region. My hubby and I joined the group at the Seacroft Historic Ocean Front Home – Sugarloaf. This became our home-base from where, each day, we all ventured out-and-about to explore the surrounding regions in the hope of capturing magical photographs. It also gave us the opportunity to share photography stories, enjoy each others company, and immerse ourselves into our photography creative efforts without the distractions of daily life back home. The Great Ocean Road was a one of the many sources of inspirations for photo-taking alongside of other locations such as: Lorne where Great Cormorants and Sulphur Crested Cockatoos perched on the boughs of riverside gum trees along the Erskine River; the Erskine Waterfalls within the Great Otway National Park; stunning ocean and beach views from Teddy’s Outlook; Mount Defiance rugged coastline and ocean views; Apollo Bay Harbour and beaches; Point Bundury’s golden sand beaches and fresh salty sea-air, sunrise at Marriners Lookout which took in sweeping views from Sugarloaf around to Apollo Bay; Hordern Vale where cattle and sheep quietly grazed on scenic green pastures, majestic shoreline views at Glenaire; Lavers Hill‘s Yatezies where we experienced local bird wildlife at large; stunning ocean and beach views from Moonlight Head; Point Ronald 50 to 60 metre high calcarenite bluffs on the Gellibrand River; the iconic Twelve Apostles; Sugarloaf beach sunrise views; the surprising Californian Red Woods; and the beautiful and peaceful Hopetoun Waterfalls at Beech Forest. The ‘golden hour’ and also know as the ‘magic hour’ is the period just shortly after sunrise or before sunset where the lighting is just beautiful, soft and where a photographer really can feel like they are painting and drawing with light. I managed to capture sunrise at Marriners Lookout – Apollo Bay. The morning was just beautiful and the view from the Lookout breath-taking! It was my most favourite location for the trip. Also captured a sunrise at Sugarloaf Rock Beach and sunset at Seacroft Historic Ocean Front Home during our first night’s stay. Also managed to capture a photograph of a Harvest Moon on the same night which was a challenge, but happy with the end result. During this seascape photography exercise – I used a compact system camera, a Sony A7 Mark II – Full Frame with a Sony A FE24-240mm F3.5-6.3 OSS Lense. For some of the shots, I used the camera hand-held, and for others, I used the camera mounted on a tripod with a remote timer. Each photography adventure helps me learn more about my camera and lense; and hopefully helps me becoming a better photographer. I also used my Apple iPhone 8 Plus mobile phone for quick spontaneous photographs and gain GPS location readings. On my return home, I downloaded all the photographs into Adobe Lightroom 6. I developed a small selection of photographs. During the process of developing them I was able to see what I needed to address during my next photographic adventure. Please find both above and below, the best of what I took during this particular photography adventure. The Great Ocean Road Region, Victoria – Australia_Photographed by Karen Robinson November 2017 http://www.idoartkarenrobinson.com Comments: My Hubby and I joined a group of enthusiastic Craigieburn Camera Club Photographers on a Three-Day Trip along the Great Ocean Road and Regional areas – to take photographs of wide oceans, sunrises, sunsets, significant coastal landmarks, waterfalls, wildlife and rural bushlands. Featuring views of local bird wildlife at Yatezies on Lavers Hill. The Great Ocean Road Region, Victoria – Australia_Photographed by Karen Robinson November 2017 http://www.idoartkarenrobinson.com Comments: My Hubby and I joined a group of enthusiastic Craigieburn Camera Club Photographers on a Three-Day Trip along the Great Ocean Road and Regional areas – to take photographs of wide oceans, sunrises, sunsets, significant coastal landmarks, waterfalls, wildlife and rural bushlands. Featuring views at Apollo Bay Harbour. The Great Ocean Road Region, Victoria – Australia_Photographed by Karen Robinson November 2017 http://www.idoartkarenrobinson.com Comments: My Hubby and I joined a group of enthusiastic Craigieburn Camera Club Photographers on a Three-Day Trip along the Great Ocean Road and Regional areas – to take photographs of wide oceans, sunrises, sunsets, significant coastal landmarks, waterfalls, wildlife and rural bushland. Featuring views at Lorne on the Erskine River and Sulphur Crested Cockatoos perched on the boughs of riverside trees. The Great Ocean Road Region, Victoria – Australia_Photographed by Karen Robinson November 2017 http://www.idoartkarenrobinson.com Comments: My Hubby and I joined a group of enthusiastic Craigieburn Camera Club Photographers on a Three-Day Trip along the Great Ocean Road and Regional areas – to take photographs of wide oceans, sunrises, sunsets, significant coastal landmarks, waterfalls, wildlife and rural bushland. Featuring views at Lorne on the Erskine River of Great Cormorants resting in the boughs of riverside trees. The Great Ocean Road Region, Victoria – Australia_Photographed by Karen Robinson November 2017 http://www.idoartkarenrobinson.com Comments: My Hubby and I joined a group of enthusiastic Craigieburn Camera Club Photographers on a Three-Day Trip along the Great Ocean Road and Regional areas – to take photographs of wide oceans, sunrises, sunsets, significant coastal landmarks, waterfalls, wildlife and rural bushlands. Featuring views around Point Ronald – Princetown and Barchyscome Daisies. The Great Ocean Road Region, Victoria – Australia_Photographed by Karen Robinson November 2017 http://www.idoartkarenrobinson.com Comments: My Hubby and I joined a group of enthusiastic Craigieburn Camera Club Photographers on a Three-Day Trip along the Great Ocean Road and Regional areas – to take photographs of wide oceans, sunrises, sunsets, significant coastal landmarks, waterfalls, wildlife and rural bushlands. Featuring views at Apollo Bay Harbour and Pilgrim Geese. The Great Ocean Road Region, Victoria – Australia_Photographed by Karen Robinson November 2017 http://www.idoartkarenrobinson.com Comments: My Hubby and I joined a group of enthusiastic Craigieburn Camera Club Photographers on a Three-Day Trip along the Great Ocean Road and Regional areas – to take photographs of wide oceans, sunrises, sunsets, significant coastal landmarks, waterfalls, wildlife and rural bushlands. Featuring Views at Glenaire on the Great Ocean Road. The Great Ocean Road Region, Victoria – Australia_Photographed by Karen Robinson November 2017 http://www.idoartkarenrobinson.com Comments: My Hubby and I joined a group of enthusiastic Craigieburn Camera Club Photographers on a Three-Day Trip along the Great Ocean Road and Regional areas – to take photographs of wide oceans, sunrises, sunsets, significant coastal landmarks, waterfalls, wildlife and rural bushlands. Featuring Heathy Parrot Pea wildflowers. The Great Ocean Road Region, Victoria – Australia_Photographed by Karen Robinson November 2017 http://www.idoartkarenrobinson.com Comments: My Hubby and I joined a group of enthusiastic Craigieburn Camera Club Photographers on a Three-Day Trip along the Great Ocean Road and Regional areas – to take photographs of wide oceans, sunrises, sunsets, significant coastal landmarks, waterfalls, wildlife and rural bush-lands. Featuring back garden area at Seacroft Historic Ocean Front Home – Sugarloaf. The Great Ocean Road Region, Victoria – Australia_Photographed by Karen Robinson November 2017 http://www.idoartkarenrobinson.com Comments: My Hubby and I joined a group of enthusiastic Craigieburn Camera Club Photographers on a Three-Day Trip along the Great Ocean Road and Regional areas – to take photographs of wide oceans, sunrises, sunsets, significant coastal landmarks, waterfalls, wildlife and rural bushlands. Featuring views around Hordern Vale Region on the Great Ocean Road and sheep resting near fallen dead trees. The Great Ocean Road Region, Victoria – Australia_Photographed by Karen Robinson November 2017 http://www.idoartkarenrobinson.com Comments: My Hubby and I joined a group of enthusiastic Craigieburn Camera Club Photographers on a Three-Day Trip along the Great Ocean Road and Regional areas – to take photographs of wide oceans, sunrises, sunsets, significant coastal landmarks, waterfalls, wildlife and rural bushland. Featuring views around Hordern Vale Region on the Great Ocean Road and colourful Crimson Rosellas. The Great Ocean Road Region, Victoria – Australia_Photographed by Karen Robinson November 2017 http://www.idoartkarenrobinson.com Comments: My Hubby and I joined a group of enthusiastic Craigieburn Camera Club Photographers on a Three-Day Trip along the Great Ocean Road and Regional areas – to take photographs of wide oceans, sunrises, sunsets, significant coastal landmarks, waterfalls, wildlife and rural bush-lands. Featuring views at Teddy’s Outlook at Lorne and Red Wattle Birds resting within the seaside shrubs. The Great Ocean Road Region, Victoria – Australia_Photographed by Karen Robinson November 2017 http://www.idoartkarenrobinson.com Comments: My Hubby and I joined a group of enthusiastic Craigieburn Camera Club Photographers on a Three-Day Trip along the Great Ocean Road and Regional areas – to take photographs of wide oceans, sunrises, sunsets, significant coastal landmarks, waterfalls, wildlife and rural bushlands. Featuring views from Mount Defiance – Great Ocean Road. The Great Ocean Road Region, Victoria – Australia_Photographed by Karen Robinson November 2017 http://www.idoartkarenrobinson.com Comments: My Hubby and I joined a group of enthusiastic Craigieburn Camera Club Photographers on a Three-Day Trip along the Great Ocean Road and Regional areas – to take photographs of wide oceans, sunrises, sunsets, significant coastal landmarks, waterfalls, wildlife and rural bush-lands. Featuring views at Gibsons Steps. This entry was posted in Photography and tagged Adobe Lightroom 6, Apollo Bay, Californian Red Woods, Erskine Falls, Great Ocean Road, Great Otway National Park, Hopetoun Waterfalls, idoartkarenrobinson, Marriners Lookout, Mount Definance, Seascape Photography, Sony A FE24-240mm F3.5-6.3 oss Lense, Sony A7 Mark II Camera, Twelve Apostles by idoartkarenrobinson. Bookmark the permalink. Thank you James, and waterfalls do have a magical effect on ones sense of wellbeing. The surroundings and the sound and sight of running water, is as you say, very therapeutic. We do have a large variety of Australian bird wildlife. I can only seem to photo-capture the larger ones! The smaller ones just move so fast and by the time I have my camera in focus, they’re off. It was a pleasure and also a pleasure to browse such wonderful shots of a world so far away. These are really something. Your work just gets better and better and the scenery is glorious. Also love the bird shots.